The field of distributed learning is constantly evolving. Online technology provides instructors with the flexibility to offer meaningful instruction to students who are at a distance or in some cases right on campus, but still unable to be physically present in the classroom. This dynamic environment challenges librarians to monitor, learn, adapt, collaborate, and use new technological advances in order to make the best use of techniques to engage students and improve learning outcomes and success rates. 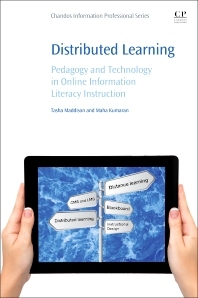 Distributed Learning provides evidence based information on a variety of issues, surrounding online teaching and learning from the perspective of librarians. 9.9 Were There Technological Barriers to Student Attendance? 9.10 Was the Timing Appropriate? 9.11 Is Synchronous Online Delivery Right for the Target Audience? Chapter 14. Embedding the Library in the LMS: Is It a Good Investment for Your Organization’s Information Literacy Program? 14.4 Analysis: How Is the Value of the Embedded System Measured? 14.5 How Does UAL Course Guide Use Compare with LTT Use? 19.3 Literature Review: Who’s Creating Library Videos? Tasha Maddison is a Librarian with Saskatchewan Polytechnic. Previously she worked as a Librarian at the University of Saskatchewan. She has been active on many committees involving online library instruction, including a team that looked at integrating library learning objects into Desire2Learn, and a task force studying the first year experience and how best to meet students needs. She spent several years researching and implementing flipped classrooms into undergraduate engineering courses, and has also explored teaching effectiveness of online tutorials when compared to in-person instruction. She completed a B.A. in English and Drama at the University of Saskatchewan, and the M.L.I.S. program at Wayne State University in Detroit, MI in 2012, where she specialized in academic libraries, reference and instruction. Maha Kumaran is currently the Liaison Librarian for the Colleges of Nursing and Nutrition at the University of Saskatchewan, Saskatoon, Canada. As the liaison librarian she collaborates with faculty to teach undergraduate and graduate students. Students from the College of Nursing are located all over the province, the country and beyond. Depending on the locality of the students, she either teaches in-person or via Web-Ex, Skype, Blackboard Collaborate or by using the Remote Desktop Connection. She has recorded videos using Camtasia and has made it available for students through her nursing research guide. She would like to continue to explore how best to teach nursing students in a distributed learning environment. Her academic interests are in the area of multiculturalism, minorities and currently distributed learning environment.